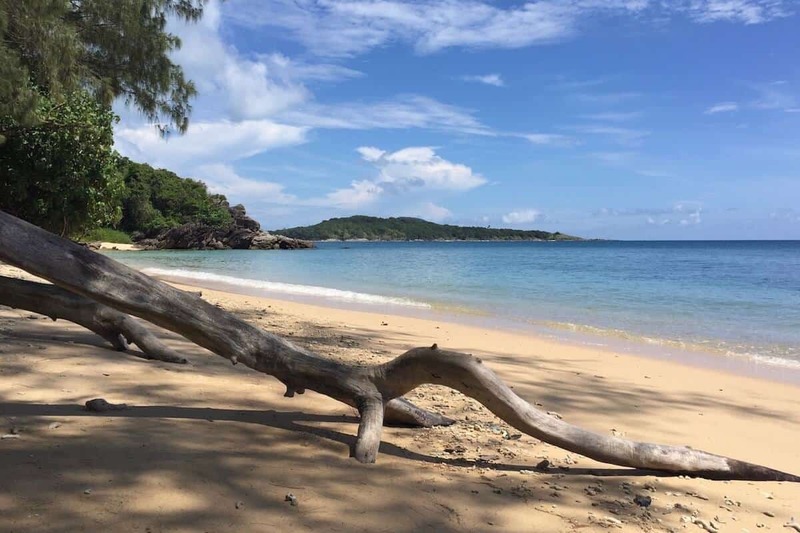 Join a 6 Days and 5 Nights Snorkeling Safari – On a Myanmar snorkeling liveaboard you will cruise the beautiful Mergui Archipelago. Although the area has been open to visitors for the last twenty years or so, it still remains largely undiscovered. 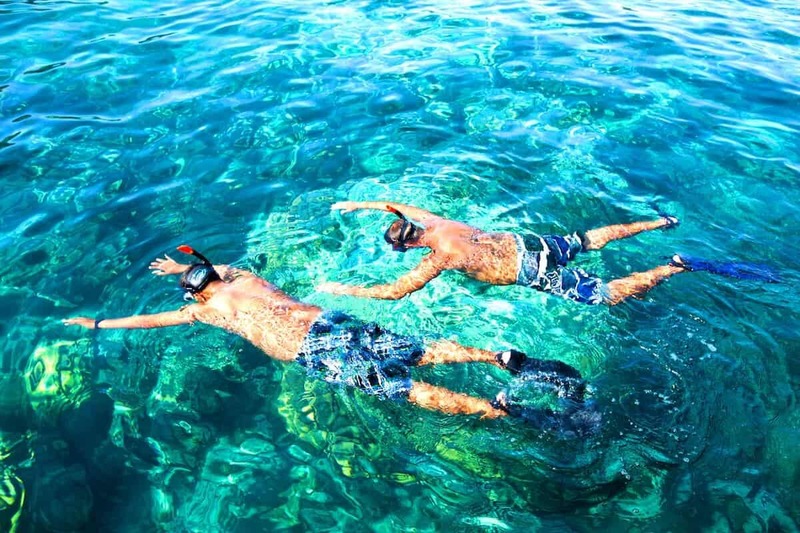 You will get the chance to snorkel well away from any crowds, we will be the only boat there. On our boat, the eye catching Reggae Queen, you can sit back and enjoy fantastic fresh Thai food and adventure out on our dinghy to unexplored places and visit pristine, white deserted sandy beaches. 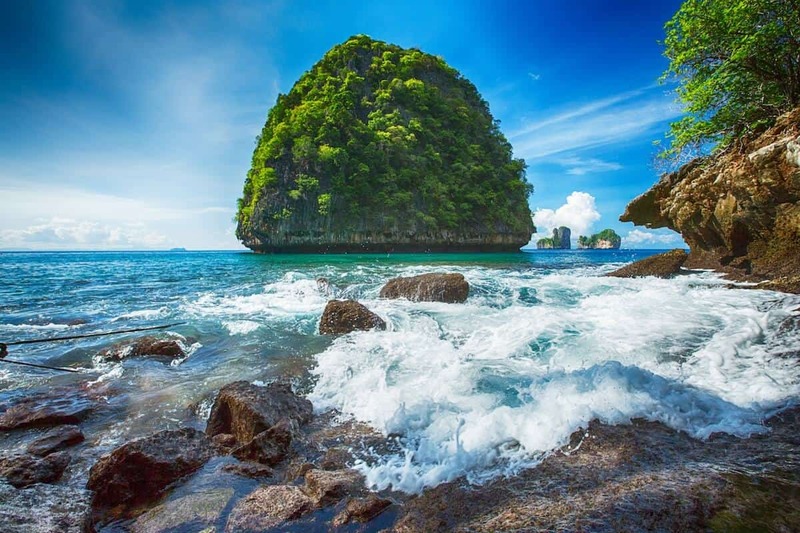 You will get the chance to learn all about the Andaman Sea marine life and meet like-minded adventurers who are also there to relax and enjoy. 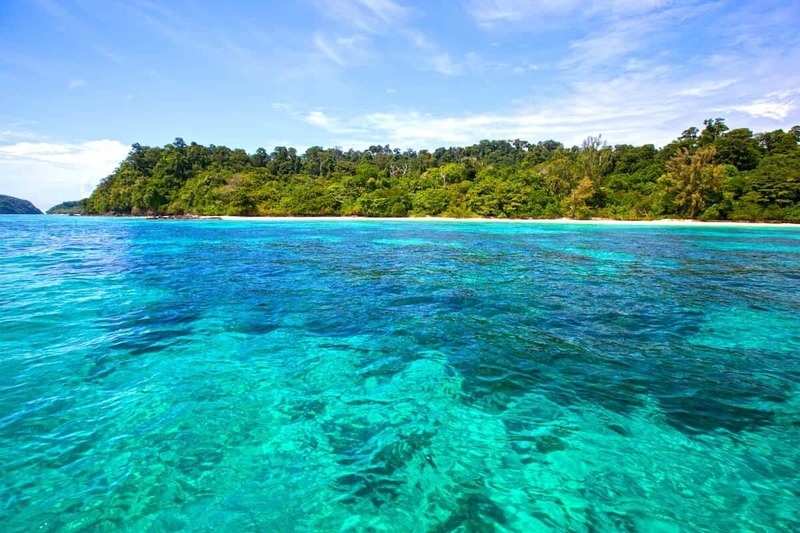 One of the highlights of our Myanmar snorkeling tour is a visit to Great Swinton Island. Here we see the Moken community and how they live on a beautiful beach with-in a beautiful calm bay. 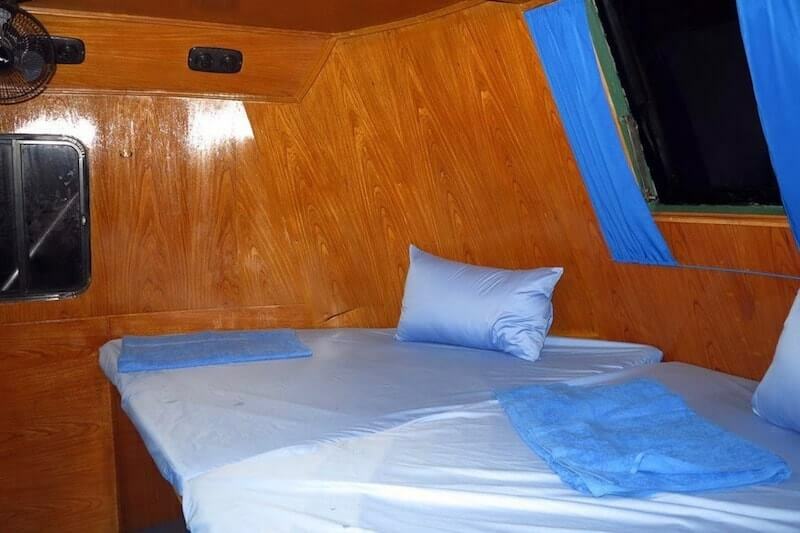 You get transferred by minibus to Ranong to embark on the MV Reggae Queen. 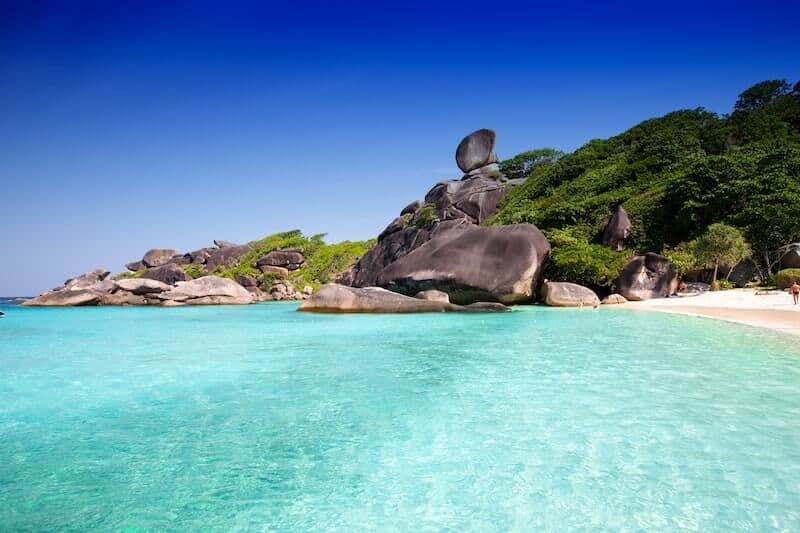 Whilst welcoming you aboard, staff will complete formalities with Thai Immigration, checking you out of Thailand. During the short cruise to Kaw Thuang, Myanmar we will serve lunch. Once we are cleared by Burmese Immigration we will weight anchor and enjoy a sunset cruise to Horseshoe Island. Dinner will be served during the journey, which takes around 4 hours before we find a calm, secluded spot to moor for the night. Wake up for a delicious breakfast served on board the boat at 7.30am; this will set you up for your first day of snorkeling in the Mergui Archipelago. Before we hit the water we hold a briefing to tell you important information about snorkelling and to review our safety procedures. We are then ready for our first snorkelling session at Horseshoe Bay. After that we will enjoy a relaxing morning cruise as we head to our next location, Poni Island about 3 hours away. After lunch we are then ready for our second snorkel session at Poni Island. This is followed by a shorter cruise to the breathtakingly beautiful 115 Island. Here we will enjoy more snorkelling, a fabulous sun set, dinner and drinks. The boat will moor here for the night. During breakfast you can enjoy spectacular early morning views as the Reggae Queen cruises to Peak Island, our first snorkel spot of the day. This takes around one hour. Afterwards we will visit the small beach at Peak Island where you can cool down in a small, fresh, mountain waterfall. Back on board the Reggae Queen we will start our cruise to Great Swinton Island, stopping of en-route for a snorkel around Rocky One. Continuing our cruise we will have lunch on board followed by more snorkelling, this time at our destination, on the south side of Great Swinton. The day starts with another breakfast cruise, this time to Chway Island which will be our first snorkel spot of the day. 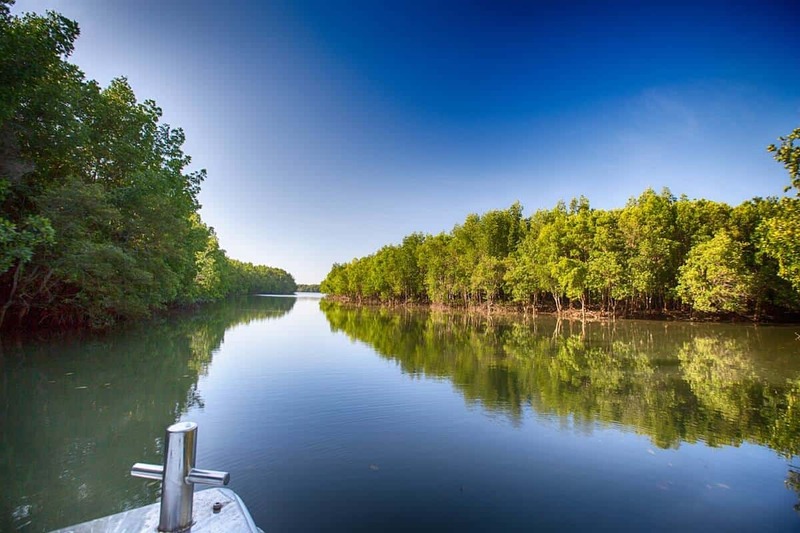 We will then cruise through one of the most scenic areas of our Mergui adventure, passing small limestone pinnacles and densely jungle clad islands as we make our way to Loughborough Island. Once at Loughborough we will enjoy lunch moored in a beautiful bay. Refuelled and refreshed we will spend the day snorkelling in the bay and exploring the nature around the island. At this point of the trip we will be far, far away from land, after dinner we can head to the sun deck to enjoy a spectacular view of the stars, with clear views of the Milky Way blanketing the night sky. During breakfast the Reggae Queen will head south to our first snorkel spot at Cavern Island. 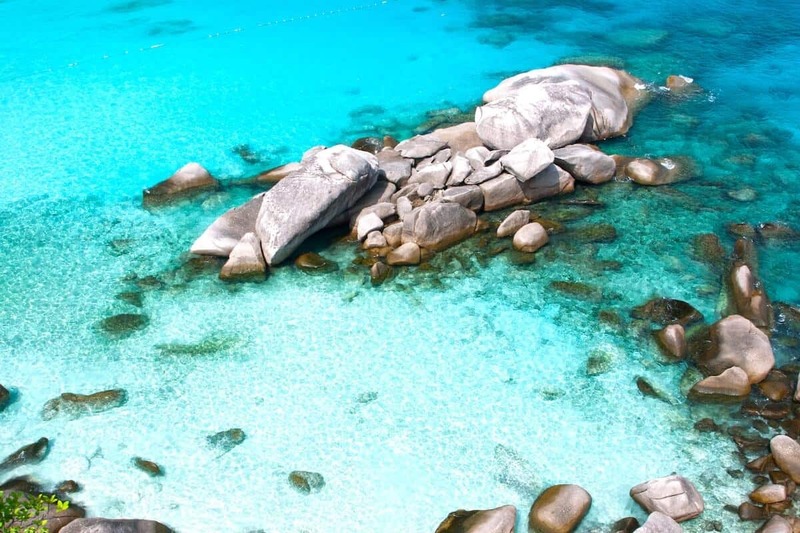 Cavern Island features another beautiful bay, a deserted beach and a series of rocky outcrops that offer some great snorkelling possibilities. 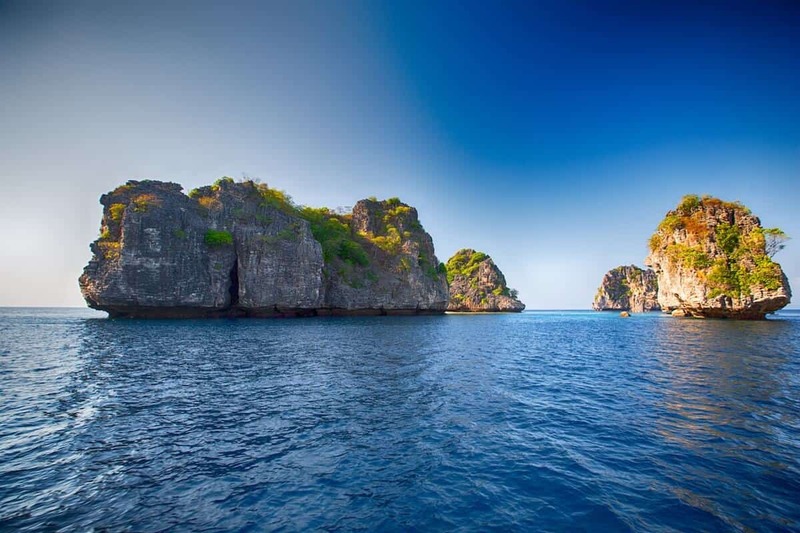 This is another beautiful area of the Mergui Archipelago, simply cruising along can be entertaining enough, though it won’t be long before our next snorkel spot at MacLeod Island. Lunch will be served as we cruise further south to Maung Yin Island for our afternoon snorkel adventure. After that it’s time to spend the late afternoon relaxing on the boat as we head towards St. Matthew’s Island. Expect a few ice cold beers to accompany another amazing sun set before we moor up for night. Breakfast on a final day is an exciting time as we cruise to one of the highlights of our Mergui tour. Our final snorkel spot at one of the most exciting locations, Western Rocky. 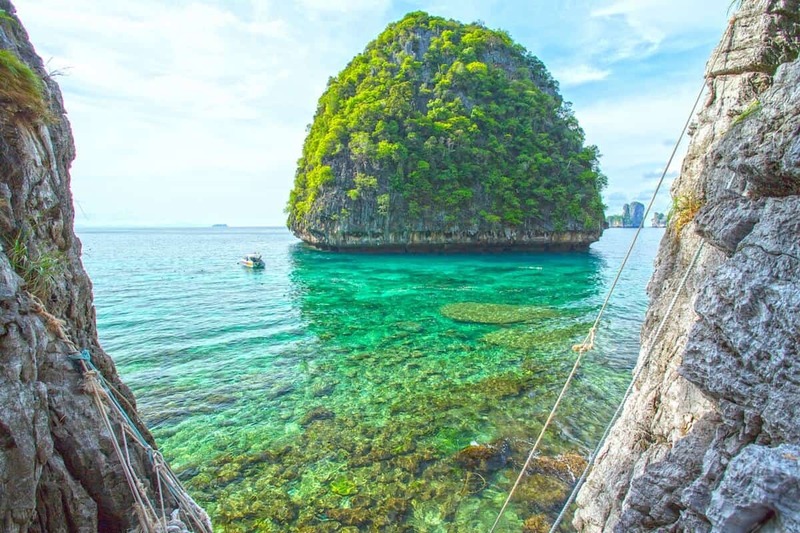 This small rocky island far out in the Andaman Sea offers the chance to encounter some of the larger fish species such as Whale Sharks and Eagle Rays. It is then time to weigh anchor and head back to the mainland at Kawthaung Victoria Point. This will take around five hours, plenty of time for lunch and to recap on all the wonderful, unforgettable experiences of Myanmar. 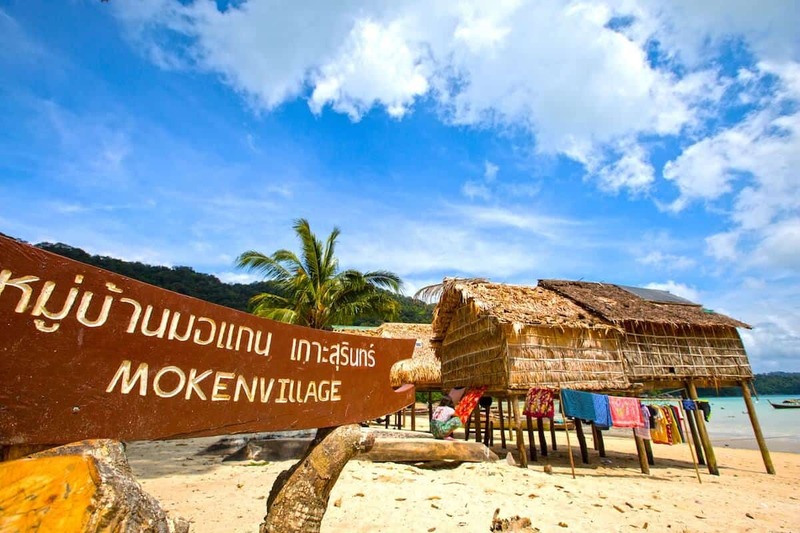 Arriving back at the mainland we will complete immigration procedures before disembarking in Ranong where our mini buses will be waiting to drive you back to Khao Lak. The itinerary and timing above are approximate and may be modified without notice to fit tide and local weather conditions. 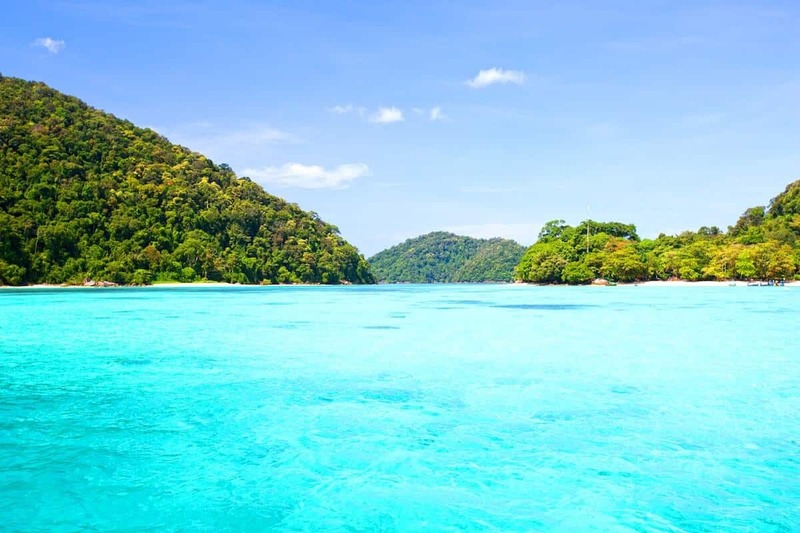 Boat operators from Thailand have a special license to enter the Mergui Archipelago, which is a part of Myanmar (Burma). We do not use the same procedures as you would if you actually entered Burma by plane or overland. And each liveaboard is issued with a government provided “guide” who makes sure that the boat stays in the designated areas only. Here our overview to clear most of the questions regarding entering Burma with our trip. About any other questions please don’t hesitate to contact us anytime. Do I need to apply for a visa to visit Burma? only, no checks, credit cards or other currencies are accepted for this fee). We recommend buying the USD before you arrive in Thailand as foreign currencies are very difficult to buy here. This makes our entry and exit procedures much quicker and easier. Is there a fee to pay to dive/snorkel in Mergui Archipelago? Yes, there are fees to pay in Myanmar. You will have to pay a combination of visa, border fee and Mergui entry fee that must be paid in clean US Dollar Bills at the border. Please come with “looking like new”, unfolded Dollars bills, it is not possible to change money at the border. At time the moment the fees for our 6d/5n trip are 250 USD per person. Please note that the Mergui entry fee is not the Burma visa fee. Boats from Thailand enter Mergui waters under a special agreement (license) with the Myanmar authorities. If you already have a visa to enter Burma you still have to pay the Mergui entry fee. What about my visa in Thailand? trip. You should apply for that re-entry permit in advance at your local Thai embassy. If you stay in Thailand already we can help you to get this but you need to inform us in due in time. For any questions about visa requirements we recommend to contact the Thai Embassy in your country! Can I join the trip in Khawthong/Victoria Point (Myanmar)? You can join our trip in Khawthong if you are traveling in Myanmar before the snorkeling tour but please make sure that your Burma visa it valid for the length of your our trip. Please note that the Mergui entry fee is not the Burma visa fee. Boats from Thailand enter Mergui waters under a special agreement (license) with the Myanmar authorities. If you already have a visa to enter Burma you still have to pay the Mergui entry fee. Can I continue my travel in Burma after the snorkel cruise? No, you can’t stay in Burma after our trip. The entry permit granted for the snorkel cruise will not allow you to travel around in Burma. You have to re-enter Thailand on our liveaboard. If you wish to visit Burma you have to apply for a visa at the Burmese Embassy in your country or in Bangkok. It is not only the Reggae Queen’s appearance that is striking. 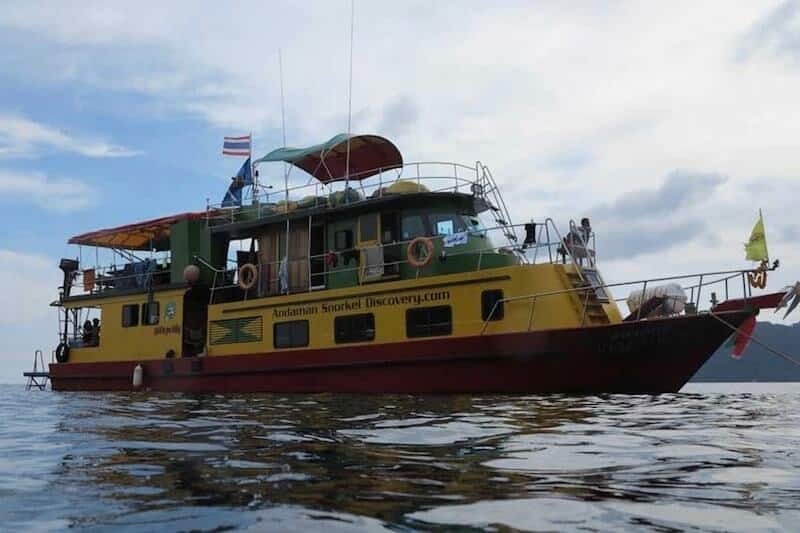 The Similan snorkel boat has a great reputation for serving delicious Thai food, freshly prepared for you on board. The boat crew are friendly and attentive to the needs of all our guests. Ther guides are out going and extremely knowledgable about our destinations. 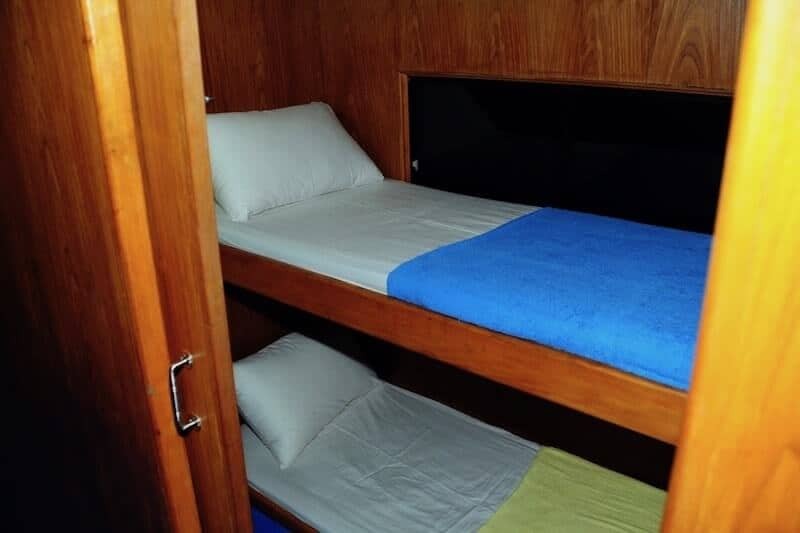 The MV Reggae Queen has all the safety features you would expect on board, including life jackets, lift raft, marine radios, fire extinguishers and first aid facilities. Let your days be full of discovery and adventure and your evening full of laughter on board the MV Reggae Queen. You can leave your luggage that you don’t need on the snorkel trip at the office, we will store it for free. We also have a safety box if you do not want to bring valuables. We provide snorkeling equipment but you can bring your own if you want to. Can children can go on the tour? Children from the age of 7 and up are welcome onboard. But please keep in mind, that you as a parent will be responsible for your children while on the boat. Spread the word by sharing this! This was absolutely amazing! My first diving experience was with Alice and she is a super-caring, experienced and lovely teacher. I was very scared to try diving for the first time, but with Alice everything went well and super smooth. She explained everything perfectly, she was by my side every moment, at the same time giving enough freedom to feel the real diving experience. Alice took great pictures and, unlike many other diving centers, Aloha Ocean Adventures don't charge an additional fee for the pictures. Alice is easy to get along with, she knows all the best spots and can find a right approach to any person. The boat is super comfortable, food is delicious, staff is helping and caring. I had one of the brightest experiences in my life and I highly recommend this diving center. This is a great example of people, who love what they do and know exactly how to make you love it as well. Went to Phuket for our anniversary, my wife has been wanting to try scuba diving as long as I can remember. I was nervous at first to jump right in without any training or prior knowledge, but our Aloha Guide, Simon, was an incredible instructor who kept us calm, well-informed, and allowed us to have 3 amazing dives! By the third dive, I felt like a pro already!We tried the "Try Scuba Diving" full day trip with 3 dives, and it was everything we hoped for - easy transportation, great service, delicious food, beautiful views and incredible diving. Would absolutely come back and scuba-dive again with Aloha! I strongly recommend Aloha Diving when looking for a reliable diving company. We went for a try scubadive last december and had a great time with Simon. He is patient, very professional and especially passionate about what he does. It was the first time for us and we felt comfortable during the whole trip. We did 3 dives in different sites around the Racha islands. We loved it!!! I've had a great experience with Aloha Diving. It was my first time diving and I did a 2 day Scuba Diving course. Alice was a very competent and extremly nice instructor. I felt very safe at all times and learned a lot in those 2 days. It definetly made me want to continue to dive and if I'm ever again on Phuket, I will revist Aloha Diving. Wow! I wanted to scuba dive do an open water diver course since many years but never really had the chance. As I traveled to Phuket/Thailand I was looking for excellent diving schools and soon found Aloha Diving based in Rawai. Although I was based in Karon this was no problem as Aloha Diving will picks you up nearly everywhere in Phuket. Ok, so I gave it a chance and must honestly say that my expectations were excelled by far. Simon —one of the two founders— gave me the perfect introduction into the theory and practice of Open Water Diving and made sure that I felt completely comfortable and secure at all times. After preparing my theory via app and with Simon's help I took the test and made it easily on the first try. Now to the practical part: Starting in a very nice and exclusive pool (day 1) we stepped up the game the next day and went for 3 dives. Before entering the ocean (what a view) I was a little afraid I'd feel a little unwell as I never tried diving before (only snorkeling), but man was I wrong. I can say absolutely the same for day 3, which was even better (and another 3 dives, which is more than other diving schools give you) as I felt even more secure and understood the before learned better. I saw some amazing underwater life, we even dove through a small shipwreck. And now I am a diver!!! If you ever come to Phuket and want to give diving a try I highly recommend you check out Aloha Diving and do a beginner's course. I don't have any comparison to other schools but with this experience I don't need one. 6 stars :) I'll be back for more! My wife and I booked for two days diving (6 dives) with Aloha. It was so good we added a third day's worth of diving. We dived with one of the owners, Alice and met the other owner Simon. They were great - transfers from our resort were seamless. The dives were wonderful and Alice not only provided great guidance while diving by spotting and pointing out the various forms of aquatic life but also provided great company in between dives. As a bonus she also provided us with photos from all of our dives for free rather than at a price (as is the usual custom among tourism operators.Aloha's diving equipment was in excellent condition and the dive boat which they used was spacious and comfortable. I'd thoroughly recommend Aloha Ocean Adventures to anyone interested in diving around Phuket and we'll be diving with next next year when we return to Thailand. We traveled to Phuket in June 2017 with a focus on spending the majority of our time diving. We went with Alice from Aloha diving and are so very pleased we did! This is a great small company it was just my husband and I and Alice. From our transport to and from the hotel, to the high quality equipment, local knowledge, safety and experience it was simply outstanding.We had booked 2 days diving with 3 dives per day and on the final dive I was so impressed we booked another day and ended up having 9 dives in total with Alice and Aloha Ocean Adventures.Having our Open Water dive certificate but not many dives under our weight belts having a professional instructor / guide who put our safety first was so very important to me and Alice and Aloha Ocean Adventures did not disappoint.Alice met us at the marina and brought us onto the shared large diving boat, she had an excellent working relationship with the crew and boat leader who were very helpful and knowledgeable. Alice explained everything to us, since it had been over a year since we dived, Alice walked us through our equipment by the end of the first dive we were handling, using and setting up our equipment like pros. Before each dive Alice would sit with us on the boat and go through the dive site, our plan for the dive and the marine life we were likely to experience. Her professionalism and love for diving made for some amazing dives! Her guidance and education has taken us from being novice divers up to the next level - she has invigorated our love of diving again.I am already planning another dive trip to Phuket and certainly be using Aloha Ocean Adventures again. Highly recommend. Aloha diving made it possible! We had a great time with amazing dives and met wonderful peoples. The service you get is just on top of the top. Transferring you like a VIP from your hotel to the boat and back...all you need to do is to slip in your gear and jump in the water....just awesome! Also during the boat ride where enough food and drinks for all to keep everyone happy. Briefing and De-briefing was good and easy understandable for all and made the dives even more enjoyable. They also look after your diving skills to make sure you got the best dives for your comfort level.Alice and the team did great and we would go diving with them any time any place again! Companys like Aloha diving became rare. Where peoples get treated like individual personalities and taken the way they are. We really appreciate that personal touch! Aloha Diving is awesome. My girlfriend and I emailed Simon months before our trip about taking an open water diver course. Simon promptly responded to our email (as he does with any email or message you may send him) with all the information we needed to get started plus set us up for some online learning. Once we arrived in Phuket, Simon picked us up from where we were staying and we began the class room portion of the course. Simon is an incredibly kind, knowledgeable, and efficient teacher. By the time it was time to start diving Simon had answered all of our questions and we felt very prepared. On the diving days Simon and his staff were prompt with pick up, briefed us on each location and the skills we needed to perform there, and overall ensured we got the most out of every dive by giving us tips and pointing out many different types of sea life. Simon also sent us a file full of pictures he took of us on each dive which is an added plus. I really do not believe we could have had a better experience. Simon and his team are the best and i would recommend them to anyone. It was a lovely trip! The boat was big with all essentials included: toilets/shower, breakfast, lunch, fruits. Instructors were professional and nice people to talk with. P.S. : hey Simon, that was a nice talk about technical diving! Excellent service, literally booked everything the evening before the actual dive. Very professional and friendly service! Perfectly organized diving school with professional guides. They will find you the trip or course which fits for you. We’ve never thought that diving would be that amazing. We were glad to make this experience at Aloha diving. They were very professional and explained to us everything very well which makes us feel save under water. Also their tank is very beautiful! We’ve had an amazing trip and diving tour as well. We’ve learned a lot! If we ever go back to Pukhet we definitely come back visit them! Update 27th March 2018:Third visit and stay at Aloha Diving and amazing again like all the time before! Every time you're with them, you feel very familiar and close to them. First time for me to meet Alice, the wonderful lady also in the office with Simon, who told me everything about my next possibilities in things of diving and adviced me perfectly. Had a great trip again to another spot for me. Phi Phi and Sharkpoint was wonderful to dive, perfect conditions underwater and also on the boat with that perfect organisation and of course the transfer from the hotel before, even if some hours booked before. My instructor Tony was very helpful, experienced and open minded. Thanks to you too Tony! Last but not least, Simon, thanks for all of your good and safe organisation! Guys, you're really great, thanks a lot again and hope to dive with you soon!Best regards & Aloha Richard_________________________________________Update 20th Oct 2017:Decided one day before in the afternoon to join this great adventure again and had a another very cool and exciting diving trip. Different locations than yesterday, same great boat, same great and nice crew (always very helpful), same perfect instructor as yesterday (many thanks to Klaus again) and a lot of other fishes (also a shark), reefs and also a wreck but ten times bigger as yesterday. It was a great tour guys from Aloha Diving! Thanks again for these amazing two days!Best regards! --------------------------------------------------------------------Fun-Diving with Aloha Diving on 19th Oct 2017I was driving by the way to Rawai, looking for a Diving company in Phuket and saw Aloha Diving. Simon (Part CEO/ very nice and experienced) told me everything what I want to know about Fun Dives and the Advanced Open Water Course, because I made my Open Water 4 weeks ago on Koh Tao. Decided to practice with Fun Dives was a good decision. Klaus, my personal Instructor (very competent and experienced too) told me everything to need about the region, showed me incredible beautiful fishes and as a highlight dived through a old wrack. It was a perfect day, perfect conditions, perfect team, perfect boat with all Inclusive. Fantastic breakfast, lunch, afternoon cakes and Drinks for free.A very big thank you to Simon and Klaus! Hope to see you soon again Guys! It was a pleasure for me! Had an awesome dive course with Aloha Diving. I was there, to pursue 4 SSI speciality courses and it went out really very well. These guys are very proffesional and they do know their job. Simon is a very great dive instructor and is calm, composed and very supportive. He made my dives a memorable experience. Amazing place, Instructor and experience! A definite address if you are looking to learn how to dive or are already an experienced diver. Alice was very patient, friendly, knowledgeable and downright lovely to dive with. 100% recommendation for diving in Phuket. When I am visiting Phuket I always end up diving with Aloha in Rawai because the company provides me with quality diving in a relaxed way. They understand that not everybody wants to be on the big boats, crammed with tourists, visiting the busy dive spots. Our last trip was on board the Poseidon. This boat can easily fit 15 to 20 divers but we were only a small group which was fantastic. We had all the time and space for laid-back diving and guess what? We discovered a new boat wreck! I definitely recommend this trip. 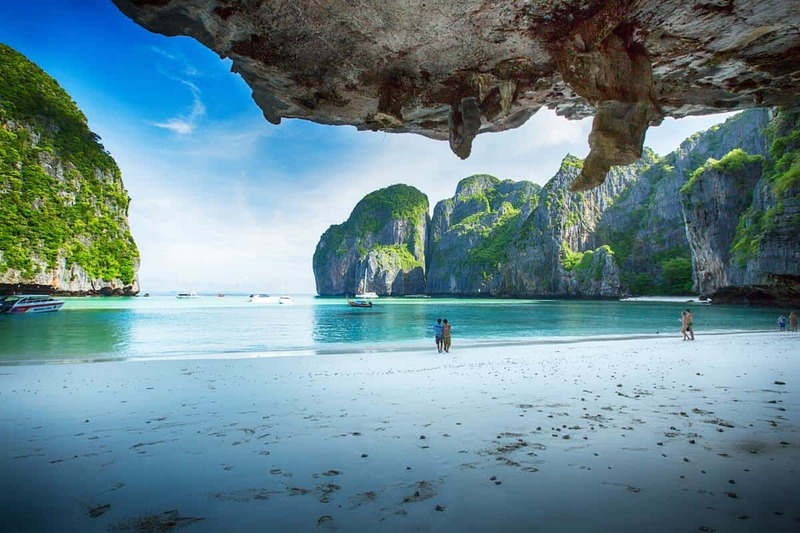 Next I will be taking the 3 day trip to Phi Phi. I cant wait! ? We just had two dives with aloha diving but these were just amazing. The team was great, professional and relaxed. Comfortable boat and just a small sized group. We loved that there was no fixed schedule so the divespots could be choosen spontaneous. And we saw a whaleshark!!! Found this place on Travel + Leisure magazine. What was supposed to be a three day course turned into 6 and I cancelled my other plans just to keep diving with Simon and Alice. These two have a real passion for diving, and you can feel it with the detail and care they take to ensure your dive experience is top notch in every way. Patient, kind, understanding, reassuring, challenging, yet encouraging, and very hospitable. If you’re learning to dive, brushing up, or just want a great guide these are your people. Small intimate boat, great crew, excellent experience all around. I would give it a million stars if I could! First time to Phuket and decided to do my open water course. There are so many diving schools in Phuket and spoilt for choice but very glad I had chosen Aloha! My instructor was Marc. He is a very experienced, patient and knowledgeable instructor who gave me a lot of diving tips and assurance and always ensured safety first. Even though it was a course with exams involved, it didn't feel stressful and instead it was a relaxing and leisure experience for me. I knew I was in good hands. Thank you Marc, Alice and Simon for the warm hospitality and laughter on board. No regret spending a bulk of my holiday on diving as it was the highlight and most enjoyable activity of my trip. Beautiful dive sites, fun and friendly crews and fellow divers. Will definitely be back for fun dives in the future! Thank you for the beautifully taken pictures too! Great to have them as my memories. Happy to return home as a certified Open Water Diver with Aloha and the journey of the beautiful underwater begins! Amazing diving in Phuket! Small group, no more than 15 people. Simon had great communication and very responsive from first point of contact. Many personal touches in customer service. As I was diving solo and was fairly new, I was assigned a dive master, Marc, to dive one on one with. Mark was very patient and educational along the way. I highly recommend this group. They are more concerned with enjoying the dive and customer service rather than overcrowding and rushing through to maximize their earning potential. They also were conscious of my vegetarian diet and were able to accommodate when the included lunch was served. They will not disappoint! Good company and nice owners. Great fun tank, I wanna try course here. I had such a blast! Sweet people especially Alice and Chock! Thanks to them, I had one of the most life changing experiences I've ever had. I came to my dream place to dive and honestly, it was better than expected! I just did 2 day trips with Aloha Diving and it was simply perfect. Thank you! To be more precise: The communication with Alice and Simon (owner of Aloha Diving) prior to the dives was easy and both were very responsive. During the day trips, which they do in corporation with another company, everything was well organized, they have good rental equipment and most important safety matters for them! To conclude: I can highly recommend Aloha Diving. Amazing people, amazing diving!!! Alice and Simon are so kind and attentive!! We spent wonderful days with aloha and, surely, we will come back!!! Tanks a lot Aloha Diving and Sea U soon!! ????? Fantastic experience, couldn't recommend more. Three of us signed up for the Open Water Diver course, 2 beach dives and 2 boat dives. We were lucky to have a super relaxed instructor and another trainee instructor to ourselves, which particularly helped ease me when I had a mini panic attack on first entry in the beach dive. The equipment seemed state of the art, from the deep container pool at the training centre to the wetsuits, regulators, diving computers etc. And we got amazing photos in the mix! Seriously above and beyond what other diving centers appear to offer, and a really high bar to beat for our future dives!